26 CPS Schools Have Lead In Their Water: What Does This Mean For Kids? CPS is testing all its schools for lead in the water. So far, a number of schools have had levels above federal limits. CHICAGO — As of Sunday, faucets at 26 Chicago Public Schools were found to have "dangerous" levels of lead in them, according to CPS officials. With more testing on its way, the city is scrambling to come to terms with a public health issue born seemingly out of nowhere. The news has sparked an uproar among teachers, parents and aldermen, who are vowing to hold hearings on how to address the situation at hand. The threat of lead in drinking water, though longstanding and hardly unique to Chicago, has come into sharp public focus since the city of Flint, Mich. was found late last year to have sky-high levels of lead and other contaminants in its tap water. Here's a refresher on what we know about lead contamination, and what researchers and public officials think can be done about it. How many CPS water sources have been found to have high levels of lead? CPS workers have collected nearly 23,000 samples from faucets in schools and sent them to "independent, EPA-certified labs" for testing, according to a statement last week from CPS. Multiple samples were taken from each of about 1,200 faucets. As of Wednesday, results had come back for a little over 5,000 of those samples, with 104 (about 2 percent) of them showing lead levels above what they call an "action level," officialas said. Collectively, those 104 samples came from 49 faucets. The results will keep streaming in over the coming weeks, and city workers still aren't done taking samples. What's an "action level?" How much lead is considered dangerous? District officials are citing the EPA's standard of 15 parts per billion as a "dangerous" level of lead, suggesting that all faucets testing below that level are safe to drink. But by the EPA's own admission "There is no safe level of lead exposure," agency spokesman Dan Abrams wrote in an email. Instead, 15 parts per billion was a number set in place by the Environmental Protection Agency's Lead and Copper Rule in 1991. If more than 10 percent of any water system's faucets measure above that level, the rule goes, the system is due for wholesale reconstruction. But Virginia Tech researcher Yanna Lambrinidou, who's spent a decade studying the effects of lead contamination in water, called the standard "totally arbitrary." "That's the number that triggers remediation requirements, in essence to alert water utility companies that something is wrong," said Lambrinidou, who along with her colleagues was among the first observers to draw attention to the Flint Water Crisis. "But that's an outdated regulation," Lambrinidou added. "There is, sadly, absolutely no level of lead that's scientifically defensible." What are CPS school officials doing about it? All 49 faucets found to exceed the "action level" were "immediately turned off," according to a CPS statement. Families of students attending those schools were sent letters notifying them of the test results, including "information about nearby medical resources where students can be tested," officials said. Officials will also "work to connect families to primary care physicians and additional health insurance resources," they added. What kind of impact can lead exposure have on children? Though it's not harmless for adults, lead exposure has been shown to have a special impact on brain and organ development in children, according to Ruth Ann Norton, president of the Washington, D.C.-based Green and Healthy Homes Initiative. "It's a neurotoxin, plain and simple, and it has no place in a child's body," Norton said. "And the younger the person is who drinks it, the greater the risk. That goes especially for pregnant women." Norton cited research showing that children never exposed to lead will earn, on average, about six times as much money during their lifetimes as children who have been affected. In February, a Mother Jones feature drew a convincing parallel between communities' lead exposure rates and their crime rates, suggesting that early lead exposure can make people act more violently or erratically throughout their lives. Why hasn't lead been detected in schools before? Before the events in Flint, Chicago officials offered little public acknowledgement that lead-contaminated water could be flowing through the city's pipes. The same has been true for cities across the country, from local governments all the way up to federal officials. Lambrinidou called it a "systematic denial" that's been "perpetuated by the very agencies which we rely on for our public health." Both the EPA and the Centers for Disease Control, she said, have chosen to prioritize leaded paint over lead-contaminated water, even though they're equally formidable threats. Norton agreed, adding that federal, state and local officials have willfully neglected lead in water for decades. In her home city of Baltimore, the EPA did extensive lead tests on the city's schools during the 1980s and '90s, Norton said, but the results were never made public. Instead, they were handed over to the city's public health commissioner, who "stuck them in a drawer," she said. "But now this is all coming to light in Washington, Philadelphia, Flint ...," Norton said "And we know without a doubt that this is a problem at older school systems all over the country." 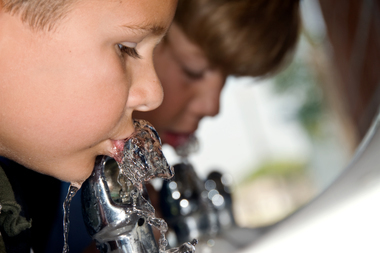 What can schools do to remove lead from their water? Part of the reason public officials have been reluctant to address the issue might be because they have no clear solution. Unlike leaded paint, which can be isolated and treated on a case-by-case basis, lead-contaminated water found anywhere has implications for the city's entire massive, interconnected system of water mains. "If water coming out of a faucet tests positive for lead, you don't know where that contaminant came from," said Karl Rocke, head of the civil engineering department at the University of Illinois in Chicago. "Lead could be leeching into the water anywhere, between where it goes into the distribution system and where it comes out of the tap." "So if old plumbing is the issue, there are ways to address that," he added. "But until [city engineers] get a better handle on that, the whole system is in question." What's more, even if engineers dug up and replaced every old pipe with a new one, they couldn't be assured of scouring the entire system of contaminants. Earlier this year, after Boston Public Schools launched a $300,000 effort to repair and upgrade the system's plumbing, its lead levels didn't fall. Instead, they spiked. Removing all the lead from a city's water system could take a generation or more. But until then, Lambrinidou said, common faucet filters are a simple and effective fix. The National Sanitation Foundation keeps a long list of filter brands shown to sharply reduce lead levels. How much would it cost to remove lead from all the city's pipes? Because it was legal to solder pipes with lead before 1986, every water fixture built before then would need to be replaced in order for the city to be sure that its water is lead-free. Since a project of this scale has never been tried before, it's impossible to know just how much taxpayer money it would take to get it done. But the cost in material, time and manpower would surely be astronomical. A current proposal to replace the pipes in Flint is projected to cost around $1.5 billion, Rockne said, and Chicago's population is more than 27 times larger than Flint's. For a different perspective, it costs, on average, about $11,000 to replace the plumbing in a single home, according to the Green and Healthy Homes Initiative. What can CPS parents do to make sure lead in water is taken seriously? • 6 p.m. Monday at Mather High School, 5835 N. Lincoln Ave.
• 4 p.m. Tuesday at Michelle Clark High School, 5101 W. Harrison St.
• 6 p.m. Tuesday at Whitney Young High School, 211 S. Laflin St.
• 6 p.m. Wednesday at Back of the Yards College Prep, 2111 W. 47th St.
•4 p.m. Thursday at Hyde Park Academy High School, 6220 Stony Island Ave.
• 6 p.m. Thursday at Corliss High School, 821 E. 103rd St.
• 4 p.m. Friday at Simeon High School, 8147 S. Vincennes Ave.